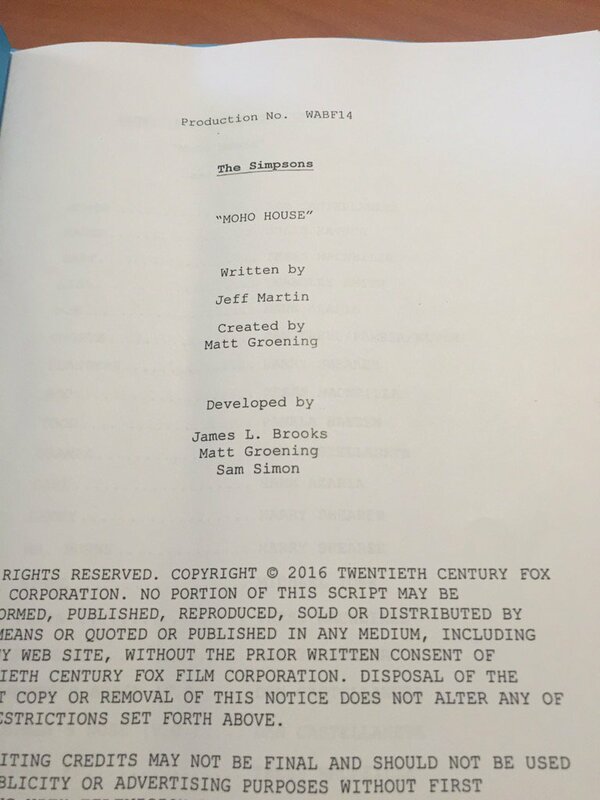 The Simpsons continues as this Sunday, May 7th, 2017, Fox aired “Moho House”, the 21st episode of Season 28 and the 617th episode to date. This Episode Fact File will recap the episodes with pictures, video clips and more. Get the scoop right after the jump! 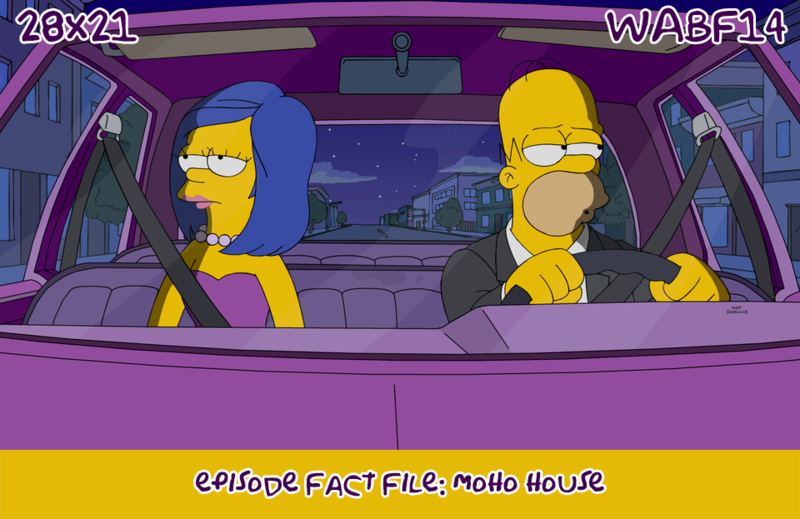 Episode Details: ‘Moho House’ is the 21st episode of Season 28 as well as the 617th episode of The Simpsons. The episode aired on FOX on May 7th, 2017. It was written by Jeff Martin and directed by Matthew Nastuk with Al Jean as the show runner. Chia Pet of the Simpson family are watered, they all grow full air, except for Homer who still has only his two hairs and his beard. While the hairs grows, he says “What? Cheap. Lousy. Uh. There.”. The Simpson family is waiting Homer to come home for Sunday dinner, he arrives hitting Flanders‘ mail box crashing it through the window, and makes Marge more mad and sad. At the Power Plant, while Homer, Lenny and Carl discuss how Marge didn’t react badly to what happened, Mr. Burns introduces to them Nigel and his wife, which then shows interest in Smithers. Marge arrives with a picnic basket at Homer‘s workplace and tries to patch their marriage with some lunch, however Nigel makes a 5 milion pounds bet to Burns, that he can break their love. After work, Nigel invites Homer to a drink, and Homer textes Marge telling her. However she doesn’t understand what the emoji he sent mean, and seeks him out on the street, seeing Disco Stu with a woman dancing, Wiggum giving Sarah jewels from the evidence box, and Ned giving harps to the ghosts of Maude and Edna. Homer and Nigel are at Moe’s Tavern and Nigel keeps pushing Homer to ruin his marriage, but Homer‘s love is too strong and he goes back home to her, after punching Moe in the face for calling Marge, Midge. Nigel however is not standing down, trying to convince Moe. Back at home, Marge refuses to listen to Homer and goes to bed, crying all night. In the morning, Marge is still angry, and Ned tries to take him to the bowl with tickets, singing. Homer is coming back home but notices Moe’s Tavern is closed. Moe arrives on a fancy car and tells them he got set up by Moho House. At the grand opening of MoHo HOUSE, Homer and Marge split up at the center, and Nigel raises up the bet, betting his entire fortune against Smithers and Burns accepts. Moe tries to steal Marge from Homer, and she agrees to dance. Smithers convinces Homer to reconcile with his wife by giving her a gift for his mother’s birthday. Marge is enjoying Moe‘s company, but he regrets betraying Homer and leaves her. Homer tries to give her the gift but she guesses it’s not for her and at home storms out of the room they were talking in, ignoring Homer‘s pleas. 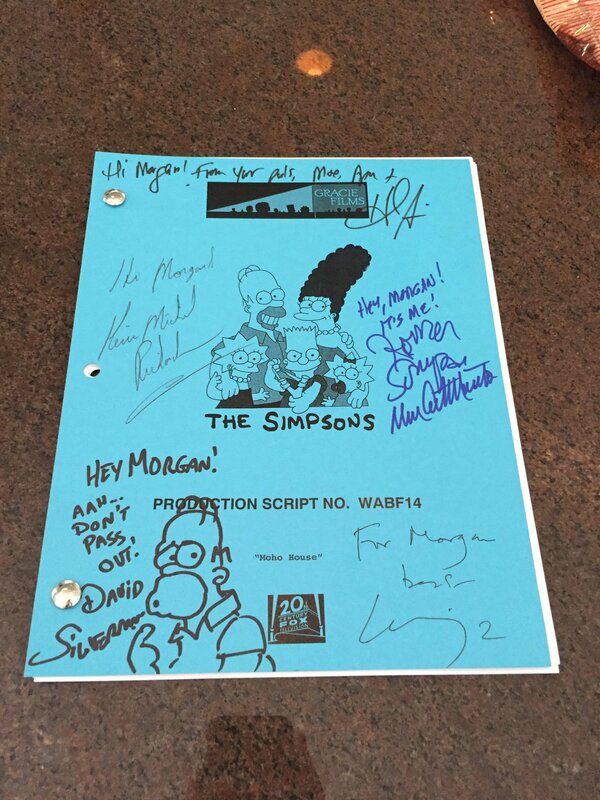 To patch things up, Moe invites Marge and Homer back to MoHo HOUSE, and Homer gifts her an hand drawn drawing of a story with them. The two makes peace, and the bet is settled, with Burns torning the check in pieces because Smithers makes him think Nigel was just in his imagination. To thank him Nigel kisses Smithers too. At the end Moe reopens his Tavernand Smithers changes his contract with Mr. Burns. 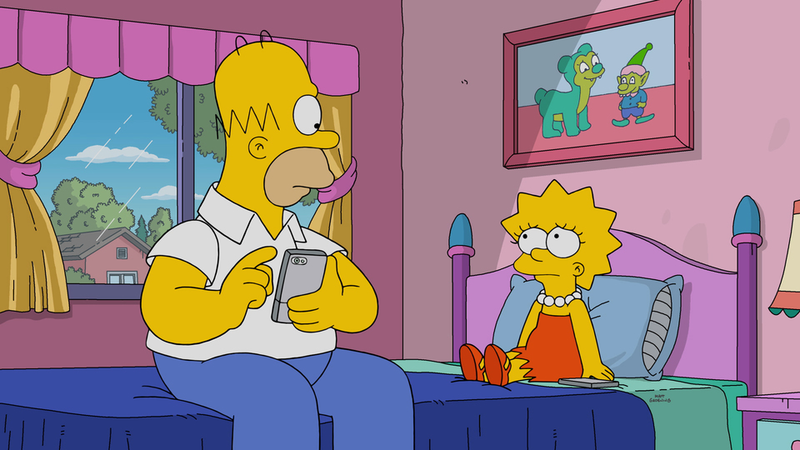 This episode’s couch gag is a reference to Chia Pets, and there is actually a real Homer Chia Pet and a Bart Chia Pet people can purchase in reality. Ned, Rod and Todd sing a parody of “Take Me Out to the Ball Game“, called “Take Me Out to the Ball Game, Lord”. When talking to Mr. Burns, Nigel refers to Smithers as “your boy Friday,” a play on the common expression “girl Friday” to refer to an assistant who has a variety of duties. Homer calls Nigel Dr. Dolittle. Barney‘s novel “An Ale of Two Cities” is a reference to the novel A Tale of Two Cities. Drunken Donuts is a parody of the popular donut chain Dunkin’ Donuts. MoHo HOUSE is a spoof of the West Hollywood branch of the Soho House club. Stogie is a parody of Sam from Casablanca. Stogie plays “Moonglow” by Will Hudson on piano after Moe requested it. When Marge is going through Homer‘s flip-book, the song “(They Long to Be) Close to You” by The Carpenters plays. The photo of Moe and several people at the July 4th Ball in 1921 is a reference to The Shining‘s ending. Moe says that the singers that sung The Simpsons logo tune are dead. A hand drawn Gracie Films gag is seen in Homer’s flip-book. Moe also leaned on the fourth wall when he said “Me thinks I see my opportunity” to the camera, only to reveal he was talking to Sideshow Mel, who he said he considered his friend. This is the first episode since “The Great Simpsina” to not start with the title card. In the case of Moho House, the episode starts with a fade in to the couch gag, then the TV credits, and after a nighttime view of Springfield, the title card letters are seen superimposed over a shot of 742 Evergreen Terrace. The letters zoom in similarly to the actual title screen with the clouds, but the letters just pop up instead of appearing. The camera zooms through the “P” without moving the background shot as Moe (offscreen) tells the audience to enjoy the show, and the episode begins. This is also the first episode to start with the couch gag. “(They Long to Be) Close to You” by The Carpenters plays again, which was the song that played when Homer and Marge first met in “The Way We Was“. Moe also refers to this while it plays. It was also used in The Simpsons Movie. TSTOTopix: Episode Fact File: Season 28: What We Know So Far! 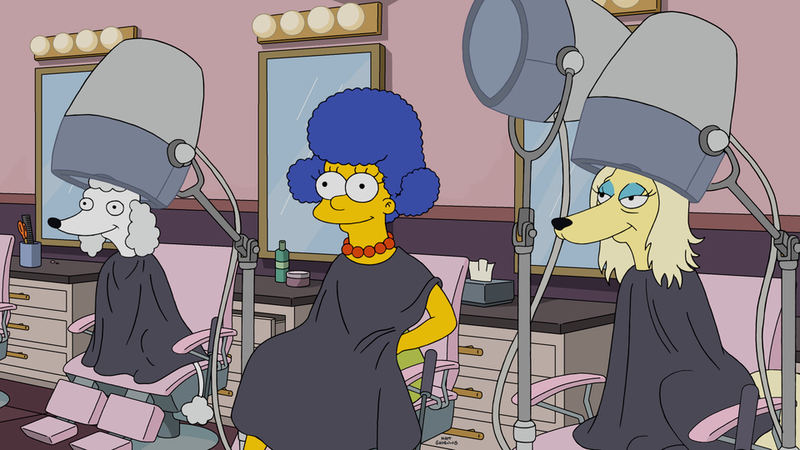 This pictures and videos are from the “Moho House” episode of FOX show The Simpsons. Their use is believed to qualify as fair use under United States copyright law. Previous Secret Agents: Returning and leaving items in the store! Next Secret Agents: Returning item in the store for a Last Chance!